In only two issues, 'The Dregs' has quickly become one of the best, if not the best new title from Black Mask Studios. Zac Thompson, Lonnie Nadler, Eric Zawadzki have created something special and uniquely compelling. This urban detective story set amid the homeless population of Vancouver is subversive and intriguing. I'm often leery of books written by multiple writers. I worry there won't be tonal cohesion as it can sometimes be apparent the book is written in two distinct voices. Thankfully, that's not a problem here. However, Thompson and Nadler compose the story and dialogue it's rather seamless and singular. What's more impressive is the delicate tightrope they walk as this homeless person as gumshoe could have strayed into parody but instead, it's a sobering crime noir into a whole new world. Arnold continues to investigate what happened to his friend Manny. And like any good amateur detective raised on pulp novels he has to walk the streets, ask a lot of questions, and follow the leads. First, he has to make a daring escape from his captors from where the last issue ended. If nothing else, Arnold is resilient and dogged. 'The Dregs' reinvents the mystery thriller with not just a refreshing new protagonist but also introduces us to an underworld that society likes to pretend doesn't exist. Through Arnold, we see the plight of the homeless as he navigates the landscape he's familiar with. In some ways, it's as immersive as the scene from 'Goodfellas' where the camera tracks Henry Hill through the Copacabana's maze of hallways through the kitchen and finally into the main ballroom. Arnold has to walk the hallways of abandoned buildings, alleyways, and a church shelter asking the different denizens, who've made the best of their situations if they've seen someone suspicious using a very simple description. As good as 'The Dregs' is as a pulpy mystery, it also shines the light on the all too real lives of the homeless among us that are treated as merely an annoyance or invisible altogether. The comic puts a face and a person to those forgotten masses reminding the reader that this may be fiction but homelessness is a real issue. It's all brought to life through Eric Zawadzki's wonderful art. The character designs are great and the pacing is right on time but really the layouts are a knock-out. Zawadzki is innovative and takes creative risks that help elevate the comic above others. There's one splash page, in particular, that is out-of-the-box thinking and totally engrossing. And no crime drama noir is complete without dark shadows and gritty locales and there are aplenty. 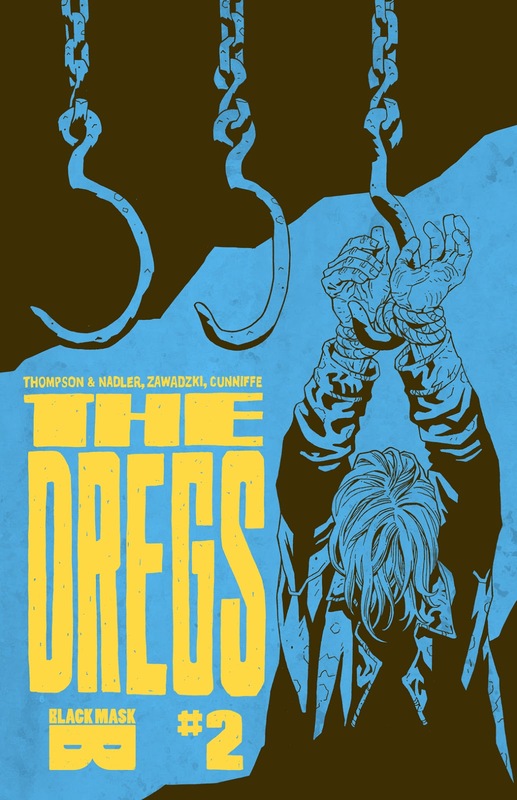 'The Dregs' is a rock-solid story with innovative art and classic crime thriller bones. It sheds an unflinching light on the dilemma of homelessness while finding dignity in its hero. The only thing that would make this better is revisiting that stunning opening from the first issue and examine that some more as I'm sure they will. Black Mask has a winner on their hands.